I absolutely love fall! It signifies the holidays are coming up which means good food! Of course one of the first things that people think about are pumpkins! These things aren’t just good for carving but make really healthy and nutritious meals! 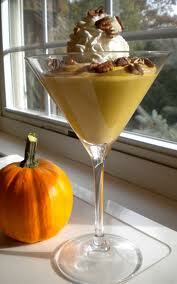 A pumpkin cooked boiled and drained packs in a lot of nutrients with no fat and little calories. I cup has only 50 calories, no fat and 245% of your daily Vitamin A needs! Now you can buy pumpkin puree at the grocery store and it comes form the can but this way looses a lot of nutritional value and it never as fresh as the real thing. 1) Wash the pumpkin to make sure it is free from dirt, etc. In a pan combine your pumpkin, water, broth and spices over a medium heat til it is smooth. Feel free to season to your liking adding more or less of the spices. In a pot bring water to a boil and cook the pasta until it is fully cooked. Drain the pasta, put in dish and top with creamy pumpkin sauce. Sprinkle the chopped walnuts on the top and ENJOY! !